Allan Powell is the firm's founder. He has been practicing exclusively in the area of civil litigation since his call to the bar in 1987. Allan's practice focuses exclusively on error and omissions liability defence for various professional groups including real estate agents and lawyers. 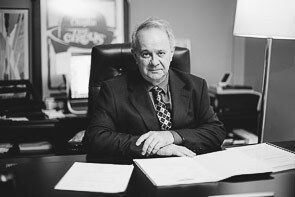 Allan has extensive trial experience and has had sole carriage of hundreds of litigation matters in areas including professional negligence, torts, commercial, defamation and construction. He has appeared before all levels of trial courts, appellate courts, private tribunals, arbitrations and mediations. In his very first jury trial, Allan convinced the jury to apportion liability against a parked car; in one of his first appearances before the Divisional Court of Ontario, Allan successfully convinced the court to leave the jury's findings intact. Allan was the gold medalist for the Faculty of Arts. When not in court, Allan can be found dabbling in the magical arts (he is a proud member of C.A.M. (the Canadian Association of Magicians) or continuing with the restoration of his classic Chris Craft cabin cruiser - which someday soon will float again! He also lends his time and energy to the restoration of the LaSalle Theatre in his hometown of Kirkland Lake, Ontario.